Love them or hate them, right? Yes, the culottes zombies came for me. And I've been bitten. 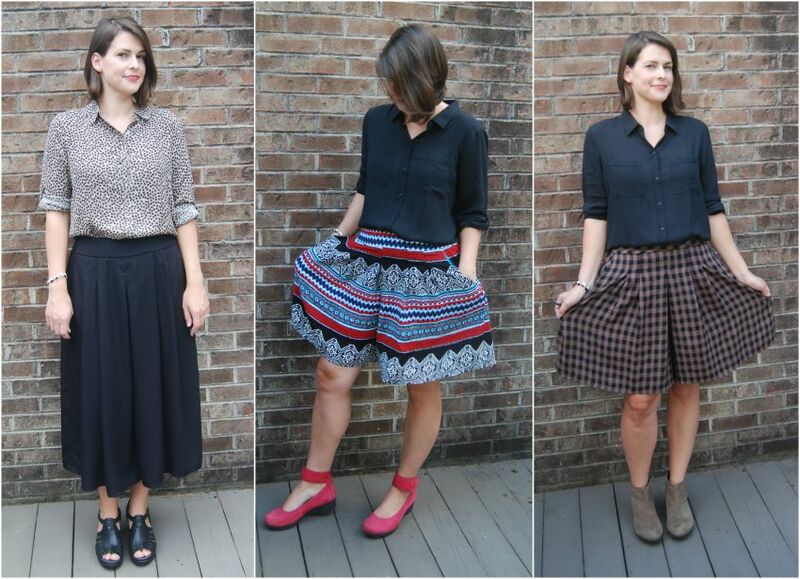 I seriously love all three pairs of culottes I've made. I made the two shorter pair this summer and just finished the longer black pair. They are all made from McCall's 7131. I actually made the first black and red printed pair very early on the summer. They have been worn almost every other day since. And I think they've held up pretty well! Despite using a fairly cheap rayon challis. This pattern is a good one. 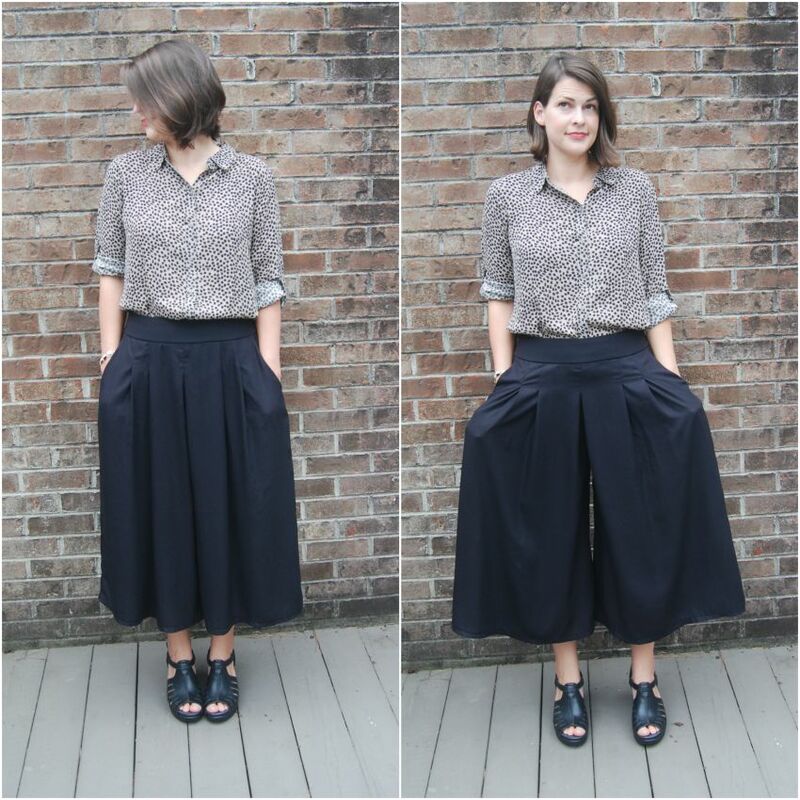 I would call these actual culottes, meaning they look like a skirt but aren't. 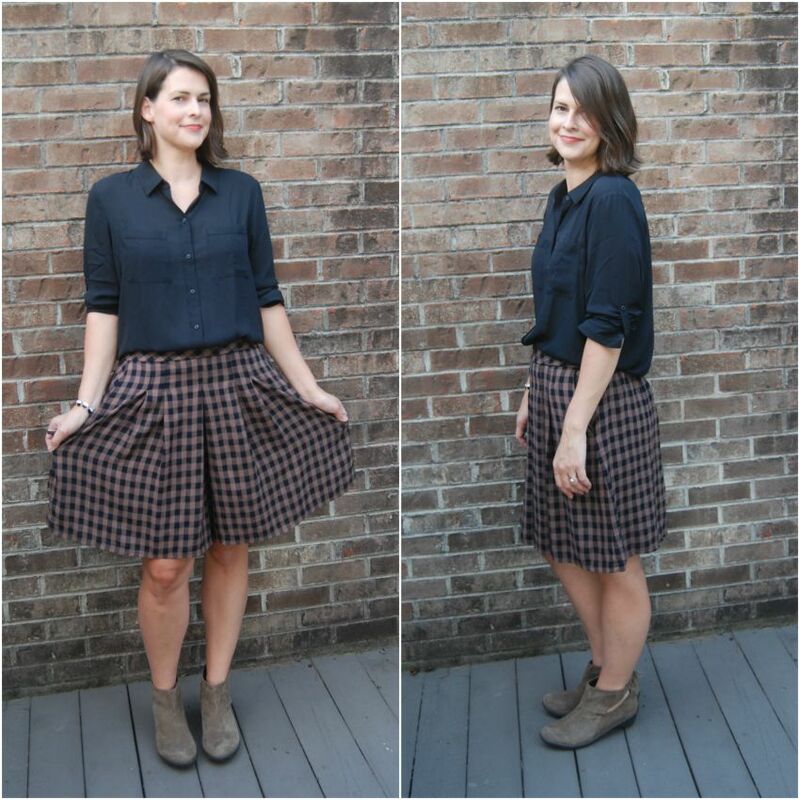 A divided skirt. 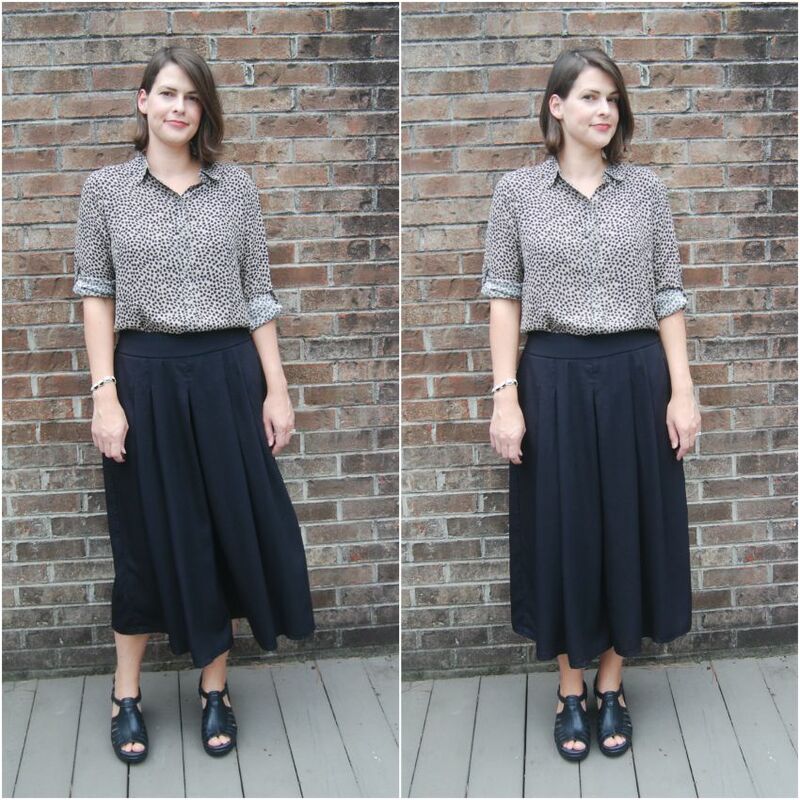 I have seen other patterns called culottes that I would probably call wide leg pants. 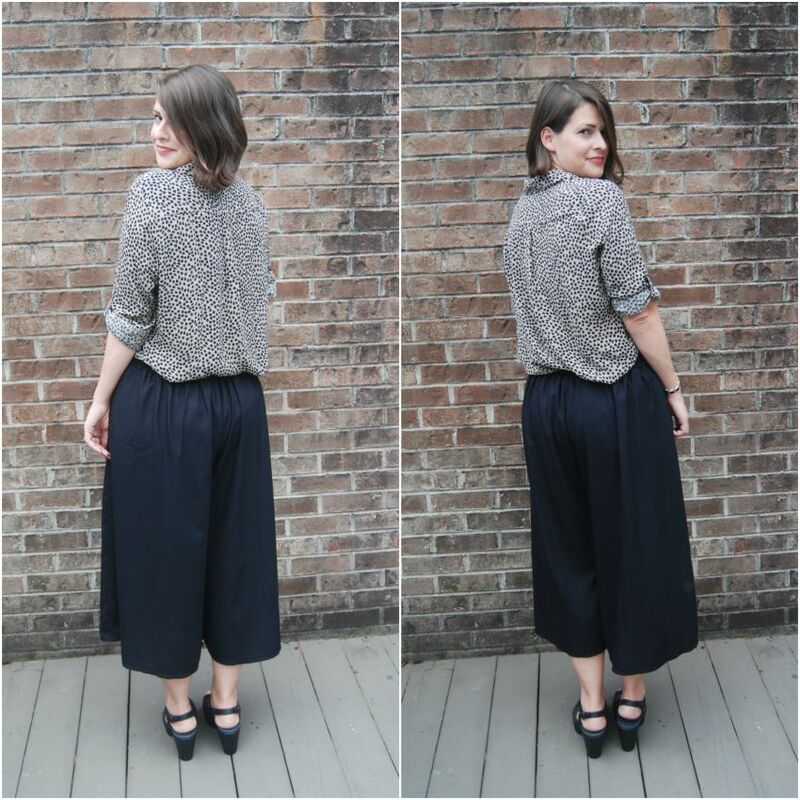 But the pleats and the width of each leg on these put them firmly in the culottes category in my book. Now that I've made this same pattern three times, I think it's time to review it. 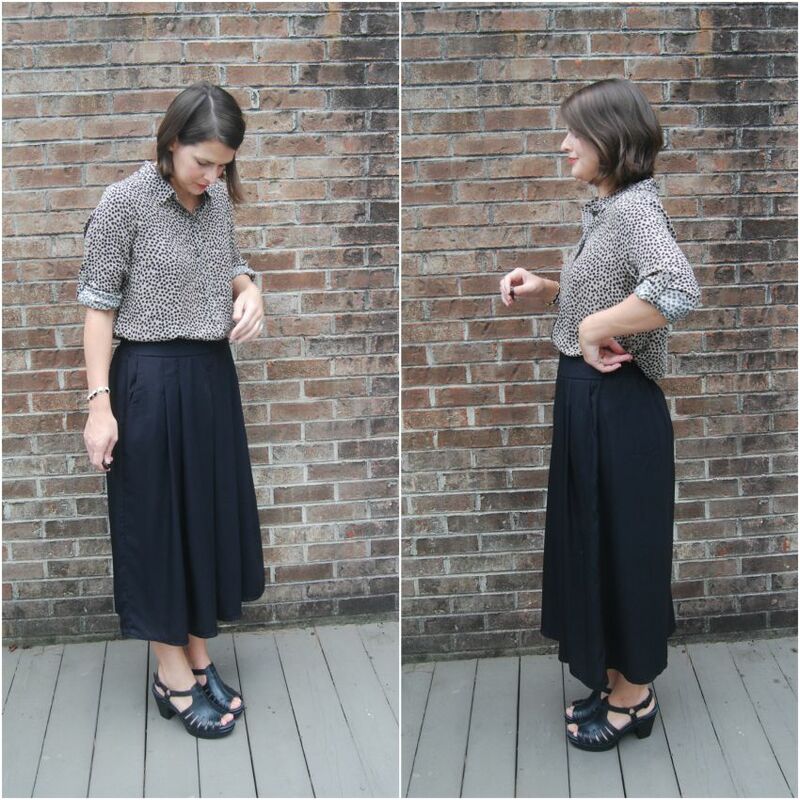 Pattern Description: Loose fitting pants have front waistband and pleats, back elastic casing and side pockets. Different hem lengths in pattern, including very short and very long. Pattern Sizing: 8-24. I cut a 16 but ended up using the back elastic guide for a size 12. Fabric Used: My first black and red version is a rayon challis. 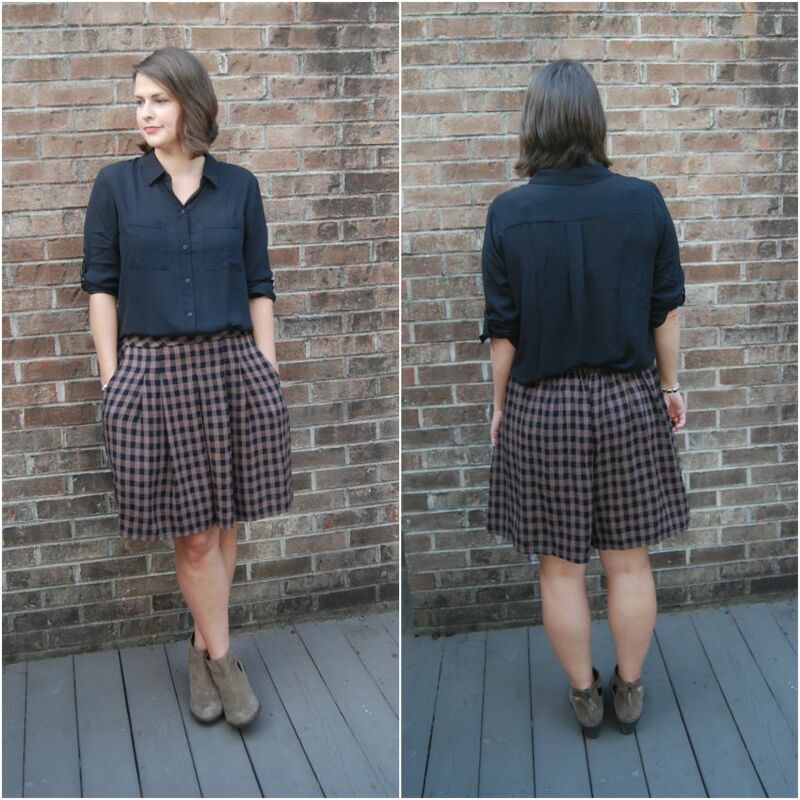 The brown and black check version is a mystery rayon blend I thrifted a long time ago (with crinkle-- ugh). And the black version is a crisp rayon poplin. Which I struggled with. There is quite a bit of puckering along my seam lines in the rayon poplin. I am guessing I needed to adjust stitch length or maybe use a different needle? Maybe a microtex needle? The puckering looks very noticeable in these photos but I don't think it's as noticeable in real life. I'm wearing them anyway. I'm hoping those seams will loosen up a little with some wearing and washing. The fabric has great drape but the weave is a lot tighter than regular rayon challis. It's very opaque. The back view is not the best in the crisper rayon poplin, also. I did an extremely mediocre job of matching prints and checks on my first two versions. So don't judge me. My red and black version are ok, except for that one stupid mismatched stripe on the front. Hasn't stopped me from wearing them, though. The brown and black check fabric has a crinkle to it which caused all sorts of issues when matching up plaids. I did my best. My pleats match pretty well but my hem is off from front to back. The outside leg seams match but the inside leg seams don't. I swear that crinkled fabric was just messing with me. Alterations/ Deviations: None, other than using a smaller elastic length. I tried the original elastic length and the waistband was much too loose. The first black and red version is the length of view B. So imagine how short view A is! The brown and black pair is view B again with about two inches added to length. And then the black version is view C minus two inches. 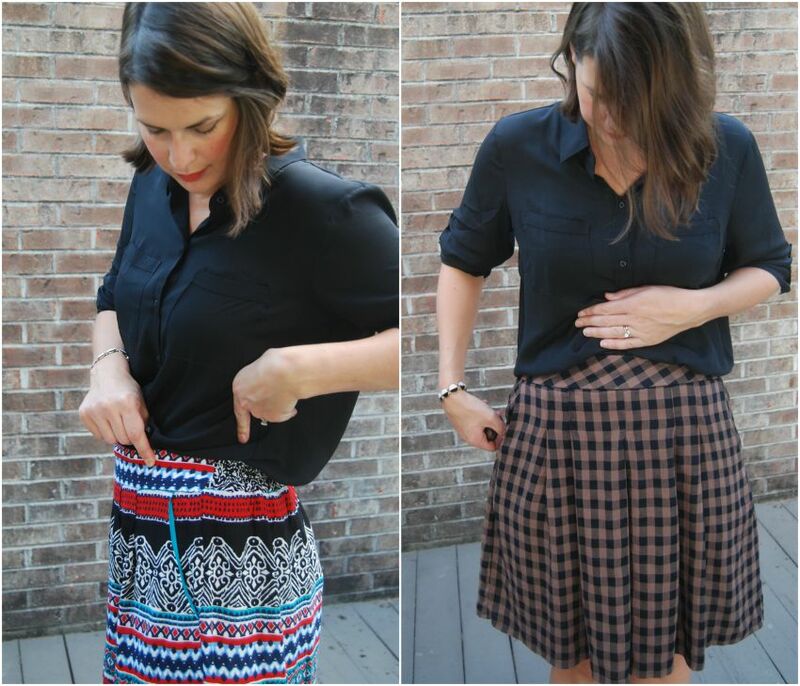 Likes/ Dislikes: This pattern has a lot of great design features and is easy to make with the elasticized back waistband. There is one front pleat that is done after sewing up the front center seam which helps hide the pants leg split. I think this might be my favorite feature and is what makes them look so much like a skirt. The back waist casing is done by sewing four channels for narrower elastic instead of one big piece. I like this, although it is very fiddly to feed all four pieces of elastic through. Kind of a two steps forward, one step back process. I tried to get a good shot of where the front waistband meets the back elastic casing. I like how this is sewn as well. The pants are totally constructed with side seams sewn last. I like the way the waistbands are sewn together with the front waist facing. It's a nice clean finish inside. I'd explain it but I think I'd just confuse people. My only complaint with this pattern has come after viewing all these photos. I did get the feeling that the front hem would dip lower while wearing these. I figured it had something to do with tightening the back elastic and having all those pleats in front. However, I have noticed on all three pairs that my side seams pull forward. Can anyone tell me why? Is it a fit issue? Or just a feature of the way the pattern is drafted? It doesn't bother me enough to not wear these. I do tend to readjust the back elastic casing throughout the day and pull up on the front waistband to keep the front hem from dipping lower. The front, with all the pleating, is heavier than the back if that makes sense. Conclusion: Great pattern! I'm saving this (I folded it back nice and neat!) to revisit next summer. I really did wear the first version to death. They were perfect for hot summer days. And I know the black version will get worn plenty this fall. I'm quite pleased with how this dress turned out, although I will admit it's a little bit frumpy. This was completely sewn on a whim. I bought the pattern, McCalls 7115 at a recent pattern sale and the cheap denim at the same time. Then I washed the fabric and cut it out the same night. I'm not really sure what possessed me since the pattern cover is really not all that exciting. The cover shows the romper view. I'm not big on rompers. I may eat my words one day, but I'm definitely not convinced at this point. I do like a good long jumpsuit on other people. Anyway, I digress. I think I was swayed by the view with the button tab sleeves and pockets, although I ended up using the shorter sleeve. 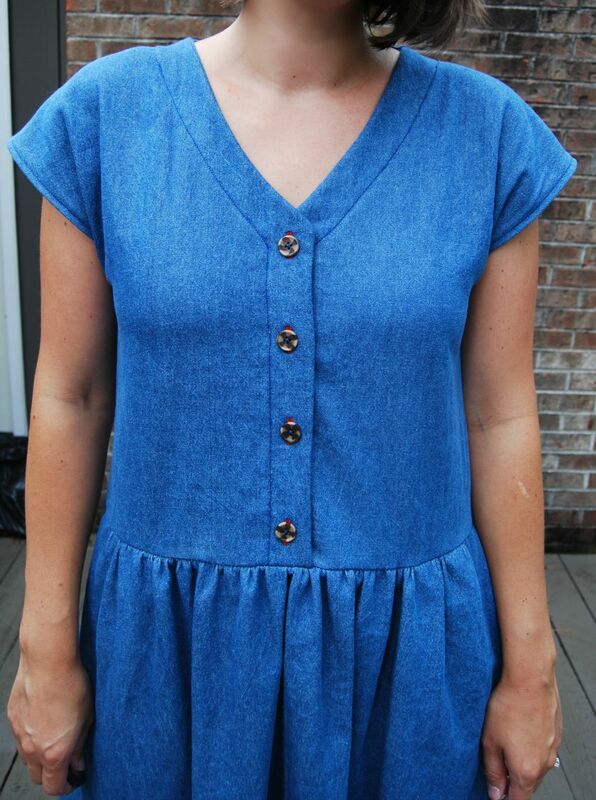 I instantly pictured it in denim and thought it would be the perfect back-to-school dress. The pattern calls for fabrics with more drape but I forged ahead anyway. I did use a lighter weight denim. I think the bolt said it was 6 ounces. Pattern Description: Pull-on romper and pullover dresses have dropped waist, mock bands (done as a facing), gathers and a front button closure. All have a cut on kimono sleeve and two views have a split for a cold shoulder look. Pattern Sizing: After looking at the finished measurements, I cut a medium and I thought the fit was pretty darn good. But really, there is not a whole lot to fit. For reference, I typically cut a 14 in big 4 patterns. My bust measurement is a 14 but my waist and hip are usually a 16. Plenty of ease in the bottom half of this pattern, though. Fabric Used: A 6 ounce denim. Super cheap. Hoping it will last a while, though, since I really like the end result. Alterations/Deviations: I made a few. I did not attempt any sort of muslin since I was using such cheap fabric. When I looked at the bodice and back shoulder line, I thought to myself that there was no way that this angle would work on anyone. But I shushed that little voice and went ahead and sewed it together, including stitching down the facing with a triple stitch. Those shoulder seams did exactly what I thought they would do. They stuck straight up on either side of my neck. So I have an honest question about the way the shoulder seam is drafted on this pattern- does a shoulder seam with such a sharp angle work on anyone? I really am curious. I unpicked all that triple stitching, marked my shoulder point (about four inches over from the neckline, fyi) and then straightened out the angle of the shoulder seam. See my shoddy photo below where I tried to illustrate what I did. Granted my shoulders do sit really straight out from neck and I have straightened shoulder seams many times before. But I still can't see that slope working on anyone. This made the back neckline sit almost straight across in between my shoulders. Which weirdly seems to work. Once I made that change, everything else fit decently well. I added inseam pockets on the skirt before attaching to the bodice. Best addition ever. I also didn't cut open my button holes. The dress slips right on over my head and I was worried about the quality of the denim. So I just sewed the buttons on through both layers. This is the dress I showed on Instagram with the red buttonholes. I thought the plain denim needed something so I did the buttonholes in red thread. I wore this on the first day of school with a pair of red shoes. I also serged the insides with rainbow serger thread. Just because. Likes/Dislikes: I surprisingly really love the dropped waist. It's not super dropped or anything, but just low enough. And I love that it is not tight around the waistline either. I like the ease in this dress. It's easy to wear. It is definitely not a dress that you wear to feel svelte. But I like that about it. I love the cut on sleeve. I did raise the opening by a half inch to lessen any bra showing but that was easy to do. And I love it in denim. I think this pattern is missing out by not including denim on it's recommended fabrics. My sewing is not quite on par but it's good enough for a first go. My buttonhole placement wanders a bit and my hem is not great. I made the teeniest little baby hem I could to preserve some length. This is the length that pattern calls for and I could do with one more inch. There are some strange wrinkles around the armhole but I'm guessing that is most likely due to using a crisper fabric with a cut on sleeve. Could be a fit issue. 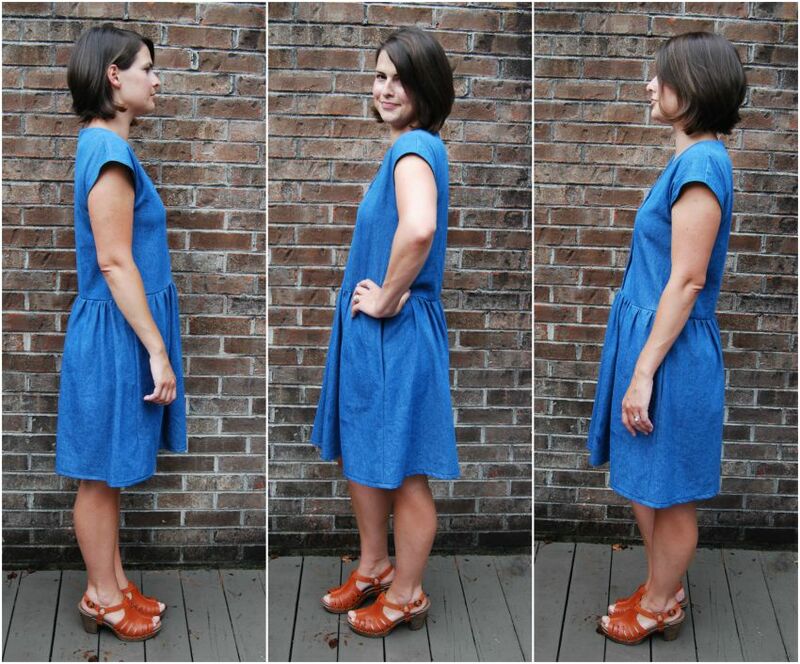 Conclusion: Great, easy pullover dress. Perfect for teaching. In fact, I love this dress so much that I've already made another and I'm adapting a blouse version. Coming soon!